Dress Up Rail free plan. This childrens dress up rail is a simple project built using stair rails. Get the free woodworking plans at the link. Dress Up Cart free plan. Build this dress-up center and keep all of your childs play things organized in one space. Dress Up Center free plan. This child size dress-up center features a drawer on the bottom as well as a rod for hanging outfits. When the child grows out of dress-up this will easily convert to a bookshelf. Dress Up Tower free plan. 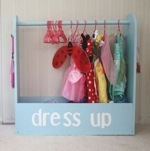 Build your own dress up storage tower for you little ones! This step by step plan includes everything you need to DIY a dress up storage center with a smaller footprint for those smaller spaces. Dress Up Storage free plan. Creating a dress up center for your little princess (or prince) is easy with these straight forward plans. Features a large open base area perfect for accessories and a hanging bar for outfits.